For your business to thrive, you need a strategy. It doesn't matter whether it's a formal 5-year road map, or an ad-hoc improvisation; it's evolve and grow or stay still and perish.Here's where culture comes in: the successful execution of a business strategy relies fundamentally on the frontline activity, on the ground, of your people. Cultural norms - of mindset, behaviour and emotion, either promote or sabotage the operational activity that is critical to success. Let's get specific: if you want to build your capacity to innovate, this will stand and fall with the willingness of your people to stand up and walk over to talk to colleagues from different teams, and be vulnerable with them. Is that already a cultural norm? If not you are rather stuck. And here's an insight: cultural inertia is embedded into the built environment of your office space. Your office isn't just bricks and mortar. It's habits, routines and territoriality. It's permissions, unwritten rules, ivory towers and cultural ghettos. "The only space free is near the finance team, but they won't let us make any noise. "You'll need to Suresh's creative input, but he never leaves his office." "We talk about discipline, but the office is a pigsty." "The Day 1 experience for talented new starters is scrounging a tiny desk and somehow cramming it in the corner." It's no wonder cultural change programs fail so often. The cultural fabric of an organisation is anchored to the space. This is why Amicus has an entire team specialising in cultural change programs in the context of an office move. An office move is a golden opportunity for landing genuine and lasting cultural change. In an office move, the cards are thrown up in the air. For a short period of time, you have a blank slate to play with. At a neurological level for your staff, every association, memory, and emotion will be unlocked on the day of your move. …and a new legacy will be established in your new home. If you don't write it, it will write itself, most likely in replication of your existing regime. Our workplace strategy team works end to end to seize the opportunity for cultural transformation in the context of a move. 1. We undertake an ethnographic study of life in your current office, mapping the ecosystem and identifying the roadblocks and opportunities. 2. We come back with a report that traces a straight line from your business strategy to a new set of cultural patterns and from there to an office design brief. 3. 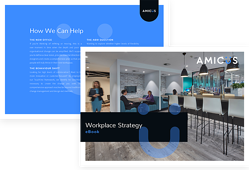 We help establish and enact an office-move narrative for your workforce, with all the necessary communication and transition interventions to prime the expectations and readiness to embrace a new era to go with your new location. By definition, an office move is a new chapter for your organisation. What is written in that chapter can be established with intent, or left to write itself. We'd love to grab a tea or coffee with you and hear about what you'd like the new chapter to say.